I went by Dollar Tree this morning to see if there were any fun craft possibilities. I’d intended on going to Michael’s which was next door, but I thought I’d check Dollar Tree first. Davey’s attention span on crafts can be iffy, so I thought inexpensive options would be great. I found some great stuff. One of the little crafts I found was a bumblebee foam picture. We made the bumblebee with what looked like little foam sprinkles. Those little foam things get everywhere, so we took the craft outside. 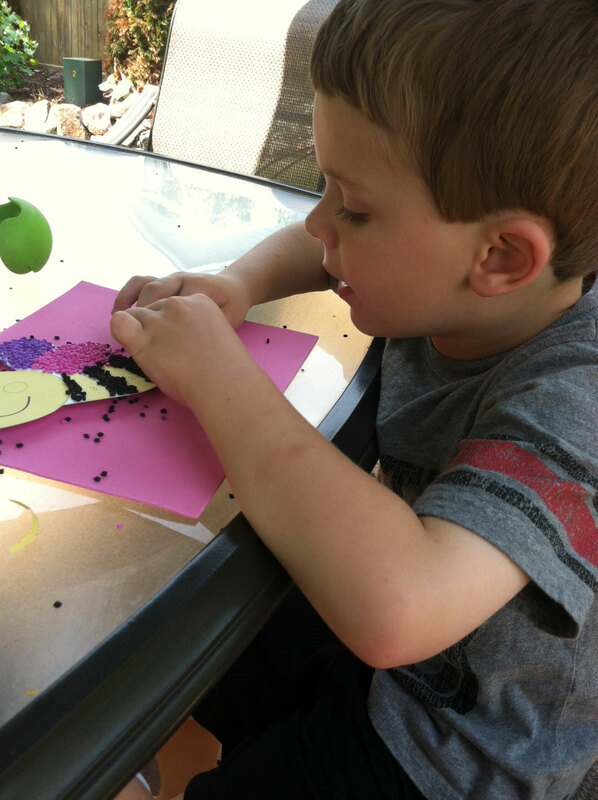 Davey has little patience for drawing, coloring or painting, but he enjoyed this craft a lot. We just pulled off the paper to reveal a sticky surface, and then Davey started dropping the sprinkly things onto the bee. He was very happy with the result. I’d packed away the glue so I found some glitter paint. Davey liked squishing the foam down so the glitter paint peeked around the edges. Nice sparkly touch. This was a lot of fun for $1.00! 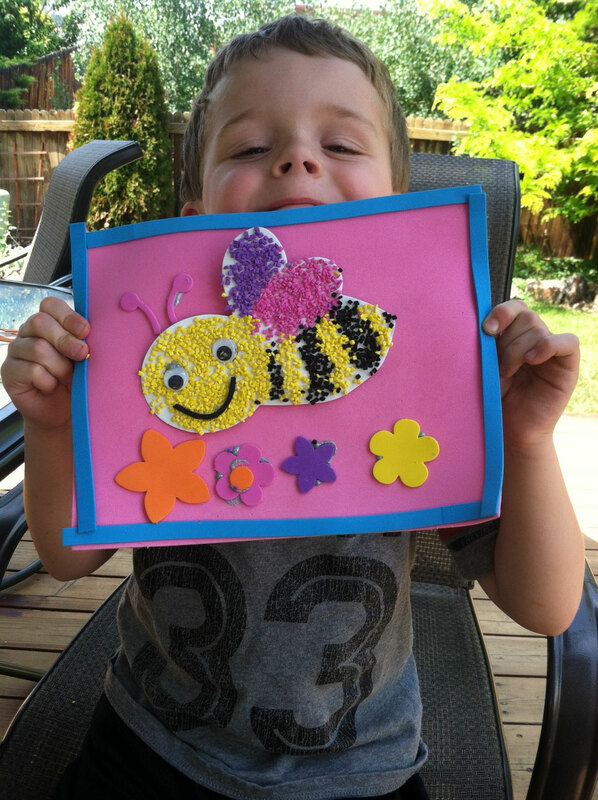 This entry was posted in Crafts and tagged dollar tree craft, foam picture by cpeezers. Bookmark the permalink. 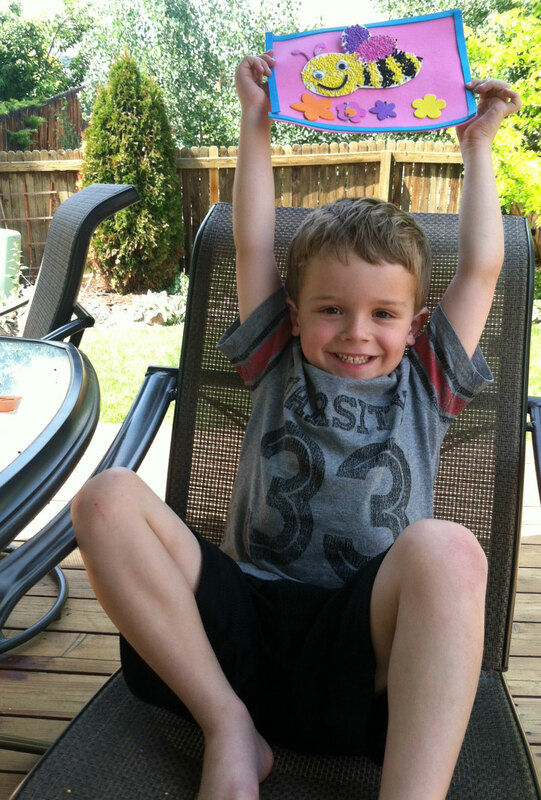 …AND great small motor skill practice! His busy bee looks quite cheerful!